Deodorant and perfume convey a message of pleasant aroma and good body odor. Although the essences of these two words are scent orientated they are different in their composition and their specific usage. Perfume has a more elegant air to it from the usage through to the composition and the names given to perfumes. Generally, perfume is the more expensive product. Deodorant on the other hand has a definite clinical value and is designed to mask unpleasant body odors. Deodorant will have aroma in its composition, but it is used differently on the body. The use of deodorant is preventative as well as being enhancing by creating a better general body odor. Perfume has been part of society for centuries and has developed into a lucrative industry. The use of plant materials and the extraction of essential oils for perfume was an ancient craft. The Latin meaning of the work perfume is per- through and fumum – smoke. This refers to the action of extracting the fragrant oils by pressing and steaming plants, a technique known as perfumery. Deodorant, a more recent innovation, is based on a chemical neutralization of body odor with the use of chemicals, anti-microbials and metal cholent compound. Perfume fragrances are added to make the deodorant smell pleasant at the same time as eliminating body odor. These two valued beauty products are used to assist in the same area of smelling good, but do vary in composition, intimate usage and cost. Deodorant is used to mask body odor produced by the bacteria that thrives on sweat. The sweat as a body fluid does not have a strong odor but the bacteria that thrive in warm moist places love armpits and other areas of the body. Deodorant has a fragrance, but it is composed of deodorizers to help control the natural body odors. Deodorants do not stop body odor, but they can suppress and neutralize the odors that are the result of bacteria and sweat together. Deodorants are alcohol based with chemicals added. The anti-microbials and triclosan metal cholent compounds are added to combat the bacteria and the odor they cause. Deodorant is a very vital part of the cosmetic industry. Mum was the original brand name of deodorants and first produced in 1888. Today the product is available for men and women and there are different applicators ranging from sprays and liquid roll-ons to solid stick applicators and gel. Neutralizes body odor cause by bacteria and sweat. Is applied to other parts of the body if necessary i.e. feet. Is a cost-effective way of maintaining a pleasant body odor? Perfume is an aromatic mixture of different fragrances. It is composed of essential oils and solvents used to produce the required perfume. The art of making perfume has been handed down through the ages from as far back as Egyptian times. The first perfumes were mixed I oils, fat or beeswax. Modern perfumes use aromatic essential oils diluted in a mix of alcohol water and perfume oils. The different strengths of perfumes are determined by the ratio of the perfume oils to the alcohol that they are added to. The greatest strength of perfume an extract de parfum or eau de Parfum, then the eau de toilette and after shaves are produced with more alcohol compound and less aromatic compound. Perfume makes a person feel good as they improve the way they smell with the scent of the perfume. Perfumes today use many different essential oils from various sources. Perfumes can be floral based, spicy or woody. They can be fruity or of herb fragrances and then combined to suit the different types of perfume. The perfume itself is applied to the body’s pulse points and can also be put on clothing. The body heat of the pulse points helps to diffuse the perfume and the more concentrated the perfume is the longer it lasts through the day. Perfumes are sold through their brand names and clever advertising using movie stars and models to capture the interest of customers. It is used to enhance the scent of the person wearing the perfume. Perfume makes the wearer feel good about their overall persona. Perfumes become signature aromas as their wearers choose perfumes with specific brand names or associations with celebrities, and always wear their perfumes. Perfume comes in different strengths allowing it to be available at different prices. Deodorant is only used on the body to mask the offensive body odors caused by sweat and bacteria. Perfume can be used on the body and on clothing and it produces feel good aromas that are attractive to the wearer. Therefore, deodorant is used to stop odor while perfume is used to bring new aromas to be enjoyed. Perfume is a mixture of fragrant essential oils and an alcohol base. The intensity of the oils is greater and increases according to the type of perfume being produced. Deodorant contains chemicals to act against the bacteria in sweat and has a small percentage of essential oils or fragrances. Perfumes come in spray mists and perfume bottles while deodorants are available in sprays, roll on and stick applicators. 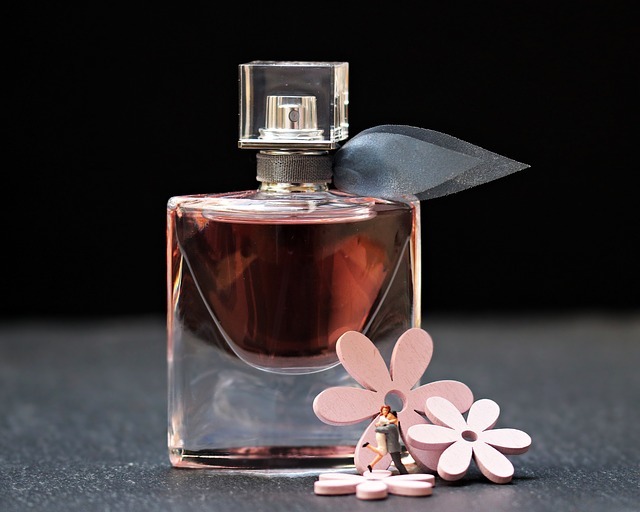 Perfume has more fragrance intensity due to the ingredients used to create a perfume. The stronger perfumes last longer on the body, but they will be more costly. Deodorants have an element of aroma, but their function and chemical additives make their fragrance intensity less compared to perfumes. Both products have cosmetic value. Their functions are different, and many people will purchase a deodorant due to its functional nature. Perfume on the other hand may be seen more as a luxury cosmetic especially the high-end brand names. The cost of deodorant is less than the cost of deodorant due to the difference in the quantity of essential oils. Perfume can vary in price depending on the composition of the perfume and the percentage of essential oils. Deodorants tend to be within a similar price range and offer similar quantities useful for everyday cosmetic use. Perfume comes in different quantities and in various types of packaging. There are branded perfumes with designer bottles and expensive marketing strategies to sell the product. Deodorants and perfumes are both part of the cosmetic industry. They have similar components, but deodorants are chemically balanced to prevent body odor and perfumes are fragrances to enhance the way a person smells. Deodorants are designed to mask odors and perfumes are designed to bring about fragrances. 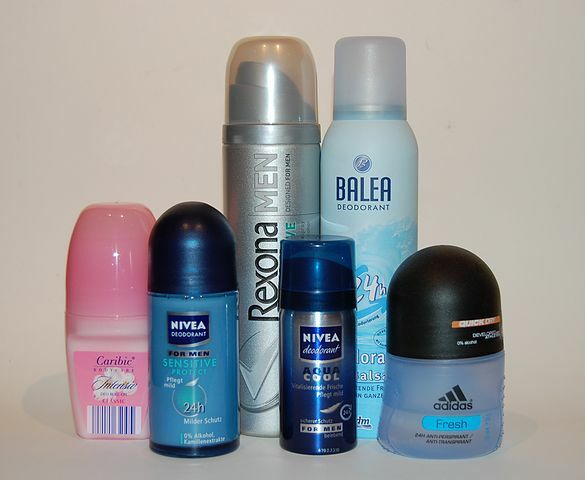 Deodorants have different presentations while perfume is usually limited to spray bottles and designer containers. There are essential differences in the amount of fragrances, the proportion of the alcohol base and the addition of chemicals if a deodorant is being manufactured. The art of perfumery has been handed down through the ages since Egyptian times, while deodorants are relatively new to the world of cosmetics. Perfume is longer lasting because of the concentration of fragrant essential oils while deodorant evaporates quicker but has the advantage of controlling body odor through the chemicals included in its composition. Christina Wither. 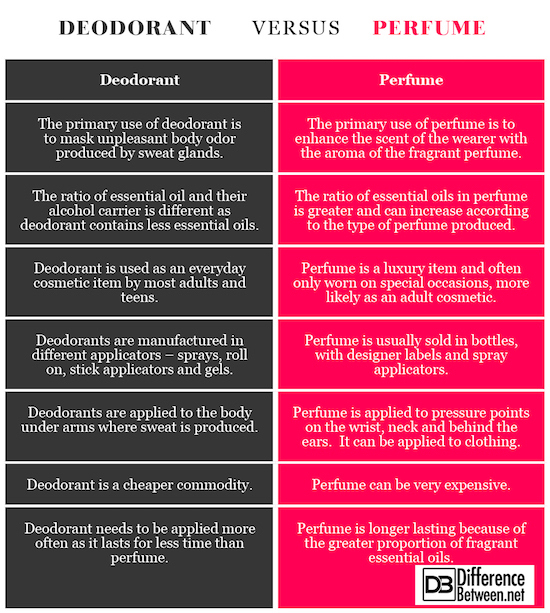 "Difference Between Deodorant and Perfume." DifferenceBetween.net. July 23, 2018 < http://www.differencebetween.net/object/difference-between-deodorant-and-perfume/ >.